Edamame are those delicious young green soybeans which you often see in Japanese restaurants. They are most commonly eaten directly from the pod with a little salt and served either as an appetiser or just a snack for when you want something tasty and healthy. Edamame can also be used in other dishes such as Japanese potato salads and other mixed green salads due to their wonderful flavour and excellent health benefits. Check our recipe for how to make boiled edamame as well as a few other ideas where these slightly sweet and nutty edamame beans really shine. 1. Empty edamame beans in to a large saucepan of boiling water. You should add a little salt to the water too for flavour. 2. Simmer for 5 minutes, then drain the edamame well. 3. Serve in a bowl with some crushed sea salt and eat the beans directly from the pod! Edamame beans can be used in many types of Japanese cuisine. 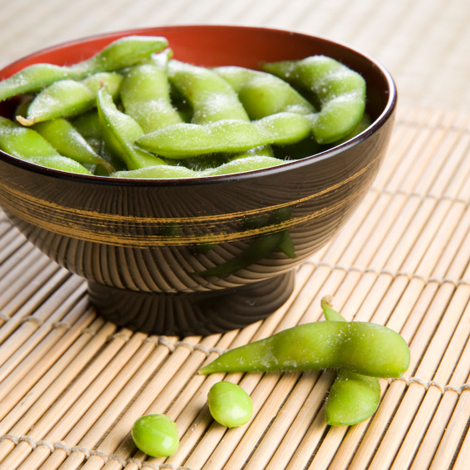 Try some of these quick and easy dishes to sample some of the ways that edamame can be used. – Cut up some cooked potato pieces into bite size chunks and slice some cucumber, carrot and onion into thin strips. Using Japanese mayonnaise is important so make sure to get some Kewpie mayo for this. Add some edamame beans once you have removed them from the pods and mix up all the ingredients with a generous dollop of mayonnaise. Japanese potato salad is a great side dish and is perfect for filling up that lonely corner in your bento box. – There are of course many ingredients that you can use for a good salad such as lettuce, tomato, cucumber and carrots, but there are some other items you can use to give it more of a Japanese twist. Avacado is a great item to use in salads, as well as wakame seaweed which is full of nutrients that are beneficial for our health and often found in Japanese salads. Our humble edamame bean is ideal for all salads, but don’t forget the most important ingredient for a Japanese style salad, the dressing! Choose from sesame, miso or soy sauce based dressings for an instant way to transform any salad into a delicious and healthy Japanese salad. – Mix up a variety of sweet and savoury vegetables such as edamame, onions, peppers, beansprouts, aubergine, ginger, garlic, carrots, lemongrass, shiitake mushrooms or any other vegetables you like in a large pan or wok over a high heat. Use a little soy sauce while cooking to help bring out the flavours and then serve with freshly boiled rice. Try adding some pieces of tofu before you finish cooking for a tasty vegetarian dish. Posted in Food and tagged Soy Beans. Bookmark the permalink. Does anybody know where I can buy Edamame in the west yorkshire area? I always have it when I visit Tokyo and would love to make my own but I can’t find them anywhere! I am not sure where in West Yorkshire you can purchase Edamame. However, we have just began to sell Edamame online using chilled cooler boxes. I put nanmi/shichimi togarashi on top too! Yum! These edamame are sold in the pod so you can enjoy them in a similar way to the image above. Using a chilli powder like shichimi is a good option for people on low sodium diets. You can also try sesame seeds or oil, curry powder or herbs like rosemary for a different taste!